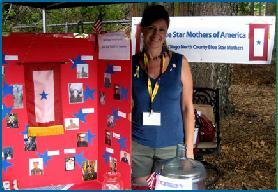 It was a very successful day for the Blue Star Mother's booth at the Fire Department Barbecue. In spite of the noon rain right at $150.00 was donated for postage for the next shipments, many people wrote notes to tuck inside, and a lot of folks took bags to fill for the holiday packages to our troops and return to the post office. Thank you, people of Palomar! Here is how you can help support our Troops! THANK YOU! Your donations mean a lot to those who serve!